Let me proclaim that Jeans are not just the uniform of young women. 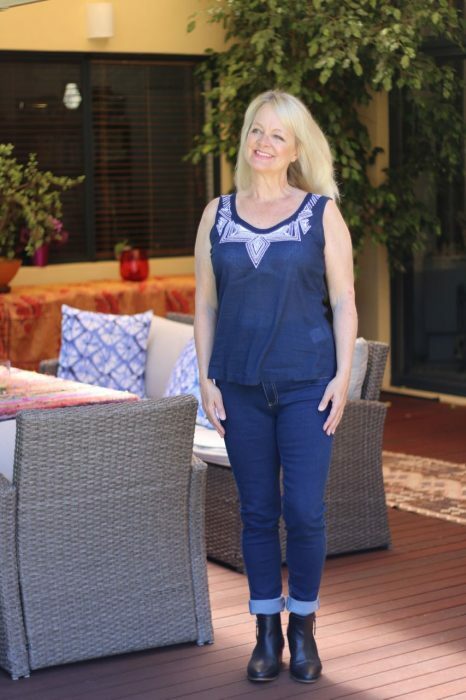 There are so many various styles available these days that choosing the best jeans for women over 50 should really be a breeze, but once you find a style you like, my advice is to stick with it. Sure, we shouldn’t be wearing our daughter’s jeans, and why would we want to cramp the style of the younger generation anyway? I believe that women over 50 need to choose elegant jeans that suit our body shape, jeans that have timeless qualities, just like us. And we don’t need to go all comfy-womfy and always choose elasticated jeans, or baggy fit jeans – no no sisters, we’re aiming for a little pazazz here! But if you like a little comfort, then try to choose stretch jeans. Before we delve deeper into the sizing, silhouette and fitting, let us accept that jeans are a favourite street-style fashion for women over 50. 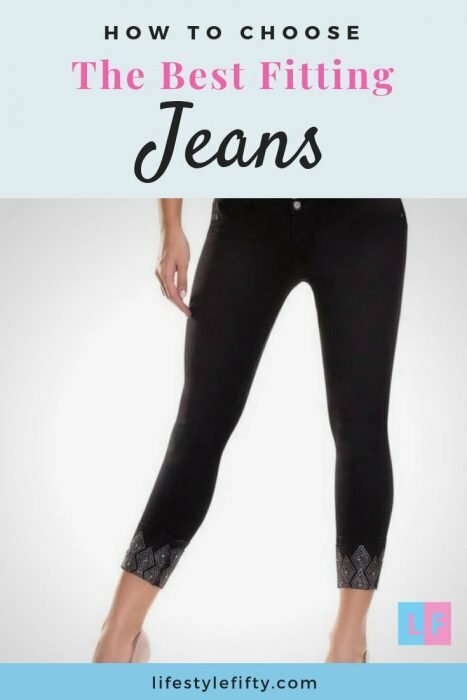 Jeans look elegant and chic when styled properly and are most certainly a trendy look for older women, as well as popular among mature celebrities and style icons. Jeans are fabulous. They’ve been around for a long time (read about the history of jeans here). They’re adaptable to style, easy to pack and probably the most low-maintenance piece of clothing in a woman’s fashion arsenal. 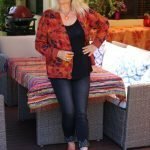 The best jeans for women over 50 are not your daughter’s low rise styles, and many women will not want to test looking like mutton dressed up as lamb in very skinny jean styles. When you find that an insanely good pair of jeans that fits you perfectly, makes your waist appear smaller, tucks your tummy in, and lengthens the look of your legs – then you’ll probably buy that brand for ever more. 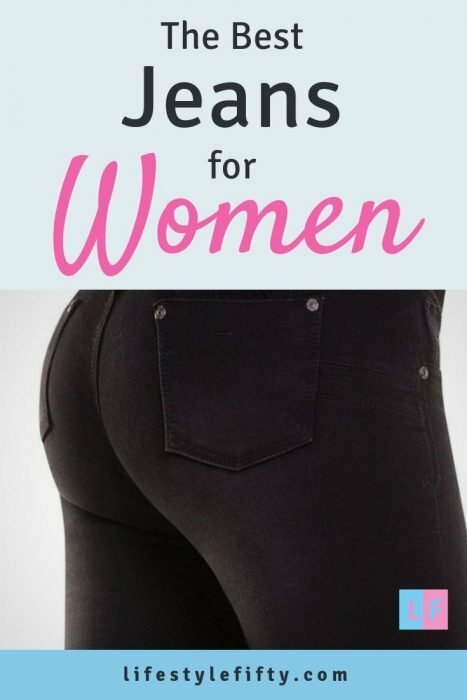 However, to find the best jeans for women you need to look beyond just the size of your waist. Let us help you decide what to consider when you want to buy the best jeans, particularly the best fitting jeans for women over 50. Our bodies have probably changed, menopause has seen to that, and what looked good on us a few years ago may not fit the bill anymore. When choosing the best jeans for yourself there are several points to consider and different styles to think about. 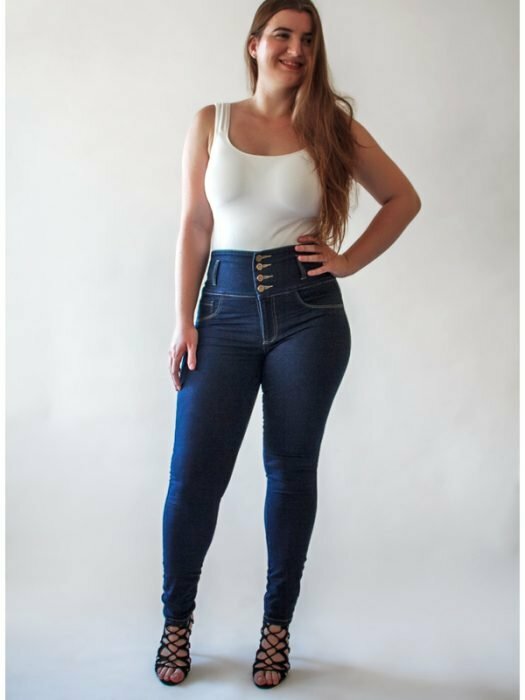 High-rise jeans, or high waisted jeans, like those on the model below who’s wearing Crazy4Jeans high-waisted-slimming-jeans. These gorgeous stretch jeans are probably going to work well, if you have an apple or pear shaped body. These are really flattering jeans for curvy women. I’m wearing the same stretch jeans as the model, but I’ve turned them up at the bottoms to wear with my black LAURA FRANKiE4 ankle boots. On top I’m wearing an Elly top in Navy from Vivid International – get 30% discount off the Elly top using the code LSFTAKE30 here. High-rise styles have a way of subtly concealing your stomach area and making it flatter as they nip and tuck in the right areas. If they are a great brand they should also do wonders for your bum too. They really are super jeans for curvy women. High rise jeans can look really flattering with a t-shirt and a blazer, but avoid tucking in your shirt with high rise waistlines unless you have a slim tummy area. If you’re well-toned in the mid-riff section, you can probably pull off a mid-rise pair of jeans. The waistband sits on the belly button. You can tuck shirts into mid rise jeans if you like, but make sure you give them a blouson effect over the waistband – and don’t try to tuck them in too neatly or tightly or you run the risk of looking ‘bulgy’. We recommend you steer clear from low-rise cuts when you’re over the age of 50, unless you’re of super model proportions, and most of us are not! You see, after the age of 50, a muffin top (blame the hormones) is likely to appear just around the waistline – as if by black magic – and it’s hard to conceal this spare tyre with low rise jeans. Skinny jeans for women have a tight fit with a taperered leg and are skinny from hip to hemline. Generally they will have a low to mid-rise waistline and will best suit taller women with slim legs and small waists. 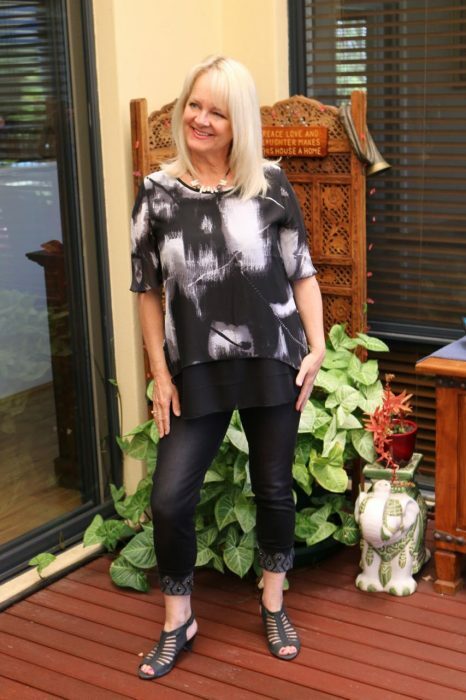 Skinny jeans are probably not the best idea at this point in life but if you do choose them, then go for a longer style tunic top to go with them. The best jeans for women over 50 probably should not include ripped jeans or faded styles aimed at the 20 something market. That just invokes the idea of ‘mutton dressed up as lamb’ to me. Boyfriend style jeans, mom jeans, straight cuts, and slim-fits are some of the style that are easy to carry off and are a little forgiving too. 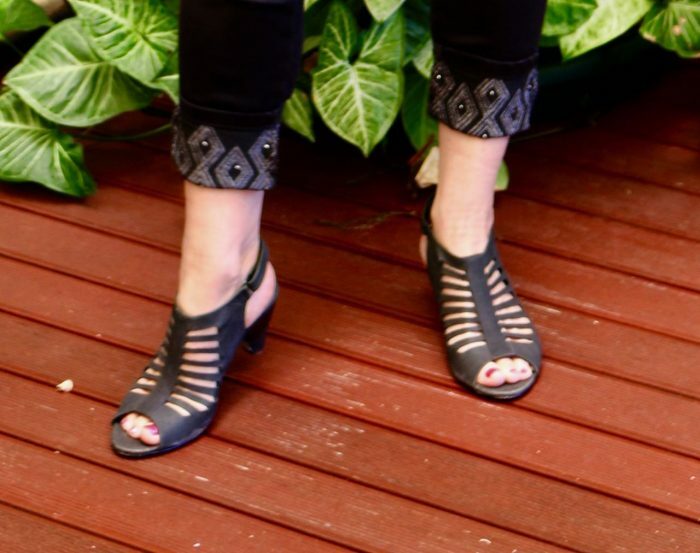 They allow you the comfort of being able to move around without worrying about being to low slung or too young, and they can look absolutely gorgeous and trendy. Slim fit jeans are more likely to have a mid-rise waistline. They are straight through the hips and slim on the thighs, with a narrow leg. Slim-fits can work well because they can successfully make your legs appear slimmer than they actually are. These jeans are workhorses. They will generally have a mid-rise waistline and the trouser leg falls straight from the knee to hem with a wider leg opening than both slim-fit jeans and skinny jeans. I’m not a fan of this style, but you might love them. They are worn low on the waist and have a drop-crotch, which gives them a baggy, saggy look. 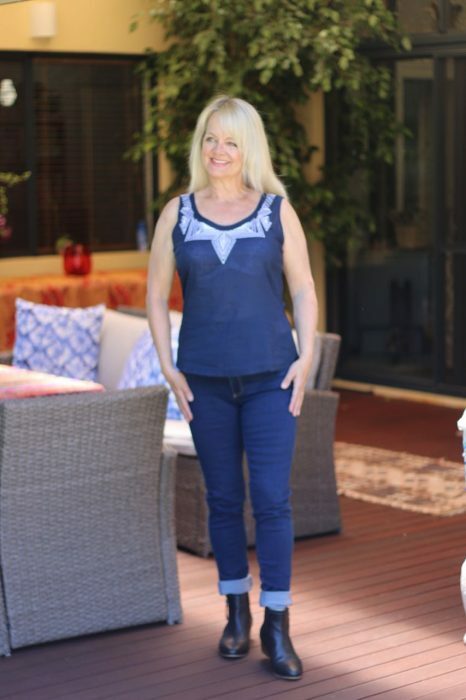 We can’t possibly talk about the best fitting jeans for women over 50 without bringing into consideration the colour. As a simple rule of thumb, darker colours have a slimming effect, so I’d suggest you stick to black, navy or dark acid wash jeans. White and pale blue jeans can work well with the right tops, and accessories, but they will generally have the effect of making you appear larger than you are. When it comes to buying the best jeans for women, sizes are all that matter. There is no substitute for trying on jeans. You really need to look at them from different angles, make sure you can sit down in them without your blood flow stopping, but also making sure that they hug, nip and tuck in the right places. If you’re buying online, check that there is a good returns policy in place if you need to change them, and once you find a style that suits you online, my advice is to buy two pairs. One for high days and holidays and one for when you don’t want to be so nipped and tucked. 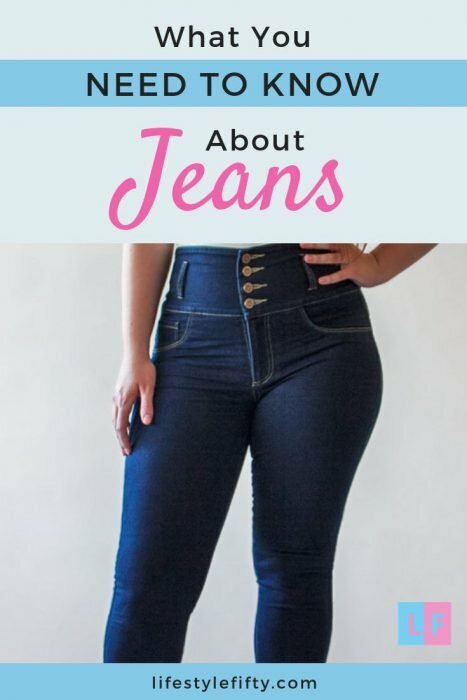 I highly recommend you always keep two sizes of jeans in your closet – one for the size you actually are and one just a size above for days when you are feeling a little bloated or carrying a little extra holiday weight around. There are days when snug jeans just aren’t the brightest idea of all time, and that’s when you get to use your one-size above jeans, and still look great but just feel a little more comfortable. Jeans have become a year round staple to wear in summer and winter, so it just makes sense to make sure you have a couple of favourite pairs of great fitting jeans to pull out at a moment’s notice. 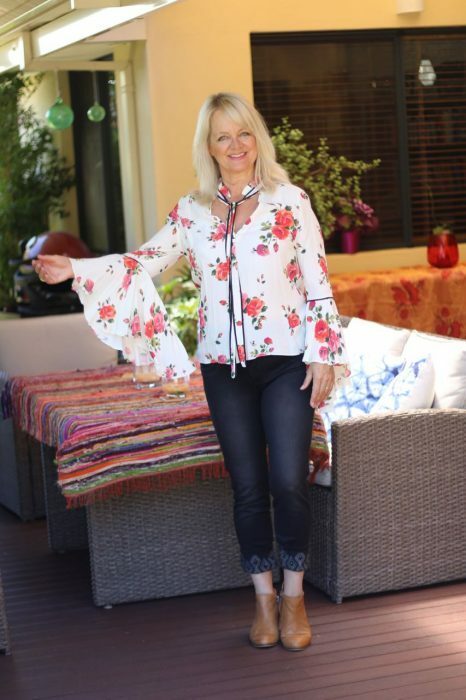 At Lifestyle Fifty we love asymmetrical bohemian tops, ethnic embroidered blouses, snowy white tees or crisp button-ups and blazers – the options to style jeans are unlimited. You most certainly don’t have to consider things as banal and trivial as your age to be able to flaunt the bad boys above, especially when you successfully find your right fit and style. Crazy4Jeans offer great fitting jeans that hug your body in all the right places, like the ones I’m wearing above. They flatter you where you need it most by targeting your belly, bum and thighs. They’re also comfortable and stretchy. Secretly you’ll be thrilled with the way they offer you a better moulded and more toned looking bottom. In the photos below I’m wearing gifted CYSM Daphne jeans in AU Size 12, USA 07. They are fabulous three quarter length, black skinny jeans. These stylish push-up jeans work wonders on your figure. 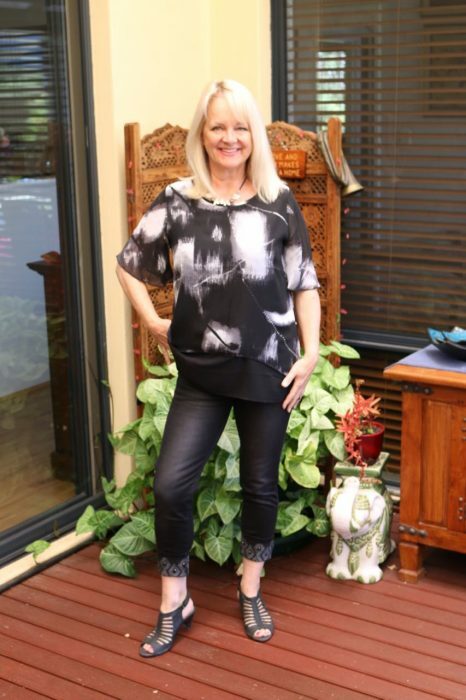 Over the jeans I’m wearing an Australian size 10, round necked, Vivid International Tammy Top in Monochrome. It’s short sleeves fall to a flattering level and the plain underlay contrast falls slightly lower than the printed top layer which neatly hides tum and bum. The Tammy Top is a best seller, and really is a nice loose cut top that covers the arms, has a great layering detail that shapes you nicely and the back panel seam detail adds a nice extra touch. Check out all the styles and get 30% discount online at Vivid International Here using the code LSFTAKE30. I really like the turn-up style and cute detailing at the hemline of the CYSM Daphne jeans. It gives them a lovely touch of pazazz. You could wear them with ankle boots or strappy shoes. I’ve styled them with FRANKiE4 SALLi tan leather ankle boots and some strappy wedge heels. Below I’m wearing Crazy4Jeans super high waisted blue skinny slimming jeans which I’ve turned up at the bottoms instead of wearing them full length. For a nice 15% discount at Crazy4Jeans online, use the code JO15 at checkout : Click here to see all the styles. In the comments section beneath this post tell us in the most creative way why you’d like to win a pair of Crazy4Jeans jeans. Competition Closes 6th February 2019 at 5pm Perth, Western Australia time. Update 18th February 2019: Competition Closed. The winner has been notified by email. Crazy4Jeans aims to provide High End Denim Pieces with a twist, offering unique styles that fit perfectly and are comfy. They’re designed to be nicely decorated, cool, trendy and unique. Each garment is made from shaping technology that integrates a bottom lifting effect, and offers abdomen control features to make women appear slimmer while ensuring optimum comfort levels. Durable fabrics, high quality manufacturing and creative sewing techniques are combined to produce the latest fashion trends. Find out more about the technology, fit and styles here. Previous Post: « 5 Reasons to wear Silk Dresses. Finding jeans for women over 50 that are flattering is not an easy job. Nothing is worse than going out to dinner in a pair of jeans so snug they cut off the connection between your stomach and your intestines. I really dislike that feeling Kate – and yet remember in the ‘old’ days how I would lie on the bed to zip up my jeans and not think anything of it! I always find jeans a struggle, the cut is so bad! So I’d actually like to strut my stuff from here, to the supermarket, to every birthday in my new jeans! Finding great jeans isn’t easy Becky I agree. Once you’ve found a brand you love you need to stick with it I reckon. Jeans to hold it all together, look great and are as comfortable as trackies that’s what all us 50+, 60+ and more gorgeous girls need! Hello Stephanie, oh wow I hope you have a fabulous time in NYC – and a lovely catch up with your sister from Perth. 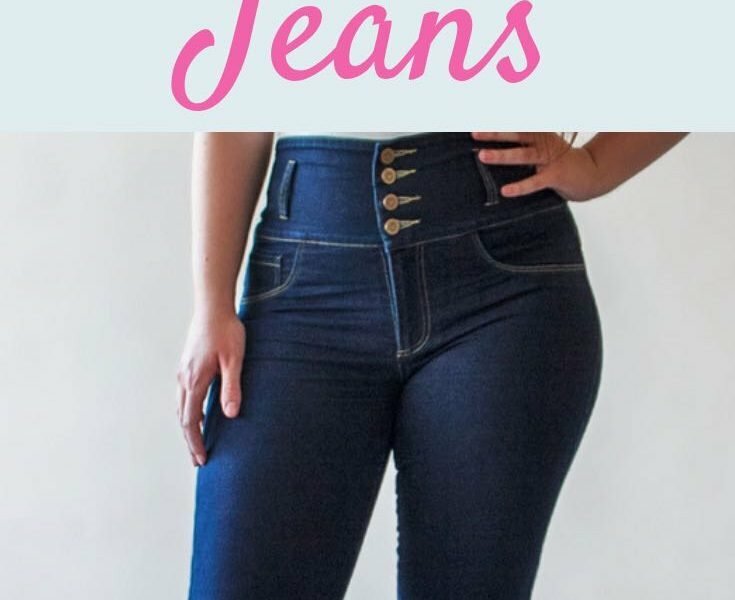 I’d love to feel and look fabulous and these jeans look like they fit real women and enhance what nature gave us. Thank you for this article! Love that you made it simple…choose this style…not these! 🙂 Of course, I’d LOVE to win a pair of jeans with body enhancing properties. I’ve tried & tried & just can’t seem to find the perfect pair! I fit into a US size 8 jean, but have a thick-ish waist, narrow-ish hips, good legs & flat bum, so getting the right combination is a challenge. Thanks again for the all the education you provide! 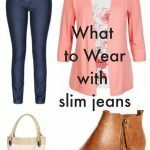 I’d love a pair of well fitting jeans – my shape these days needs all the help it can get! Love the look of the high waisted jeans which might help pull in that roll that seems to have developed over the past year or two – where did that come from? I’m loving all of your tips and the description of the different types of jeans. Now that I’ve moved away from the extreme heat of North Queensland, jeans are about to make a come back in my wardrobe. As a MARIE KONDO fan, I’ve culled my wardrobe contents and as none of my outdated jeans “gave me joy” I am now jeanless – your article couldn’t have come at a better time. 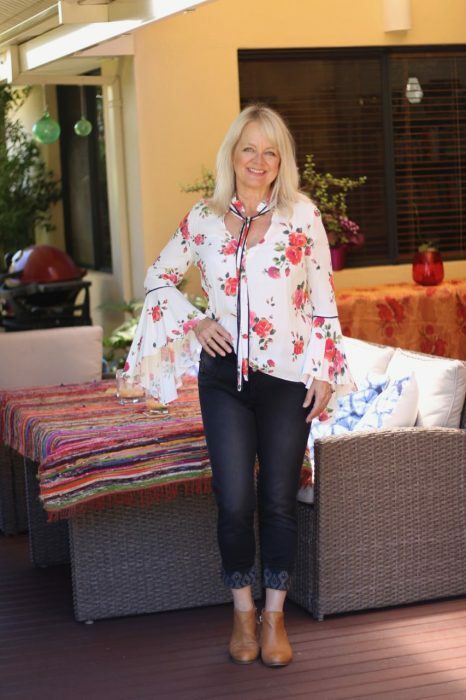 I’ll be heading to Tasmania in March – the perfect place for a cute pair of jeans! I do think jeans are a staple for every woman now!! And that’s a good thing. I’d love to be considered for the giveaway. I’ve been trying to purge and declutter and I think I went too far (eeek!!). I only have one pair of blue jeans remaining and they are from over 6 years ago and don’t even fit that well. I’m not sure how this happened but I certainly need to add to my collection now! 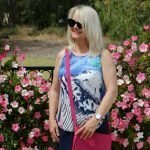 Hello – Are all Lifestyle Fifty competitions only for Australian entrants? I love the article and agree with how the bodies change as I am now not that slim woman I once was, I was a size 8 right up to age 48 then I got fibroids (one at 13cm) which destroyed my figure and then hysterectomy further changed me. Still not over it. I cant seem to get rid of bulge under belly button so I really do rely on jeans to hold me in – Jeans are so part of my wardrobe and I only wear these. So I am an aussie living in the UK and enjoy reading your emails but always miss the competitions but now I wonder if I can enter anyway. Thank you for great articles. Hi Elvira, thanks for sharing your story. I know changing body shape really does suddenly start to creep up on us as we get older. I guess the important thing is that we are still here and enjoying life. Great article. And you are so right. I do not want to appear as “mutton dressed up as lamb.” I told my teenage daughter that analogy, and we both got great laugh. You are sooo right. 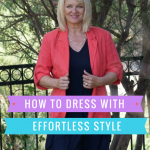 Elegant and timeless clothing is the way to go for 50 and above. And, yes, jeans fit into that category. Thanks for the tips! Thank you Camille. So glad you found the tips helpful. I’m with you Janet – finding great jeans is tricky, despite all the choices, and our bodies change shape without us realising as we get older. 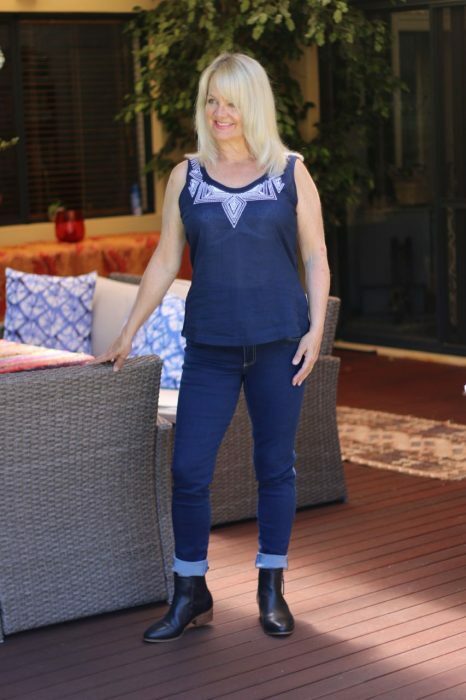 I hope you find a pair of jeans you like – I also used to like Just Jeans, but I am really loving the nip and tuck properties of Crazy4Jeans range. Why Beautiful Bermuda will steal your heart. Life after fifty when the wolf whistles stop and the roaring begins.